Andy Nickerson took a Practitioner Guided approach to working through the Chapter Companion Courses on the Watertight Webschool. Based in rural Northamptonshire, Andy and Debbie Nickerson are a husband and wife photography team producing critically acclaimed family portraits with a specialism in newborns. As well as their photography they also produce beautiful handcrafted artwork for the home. Tim Freed, editor of Toddle About Magazine described Andy’s work…“More than just nice photos… he creates works of art that make you go WOW”. Andy cut his teeth in the London creative scene shooting creative work for brands like Toblerone, Cobra Beer, ITV and Channel 4. But this photography studio is his first foray into running his own business. Like many new business owners he’d bought several business books. When Debbie left her role as a qualified nurse to join the business, Watertight Marketing was the book he suggested she read first. Andy and Debbie faced a challenge that many new business owners face, especially those that base their business from home and do everything themselves. 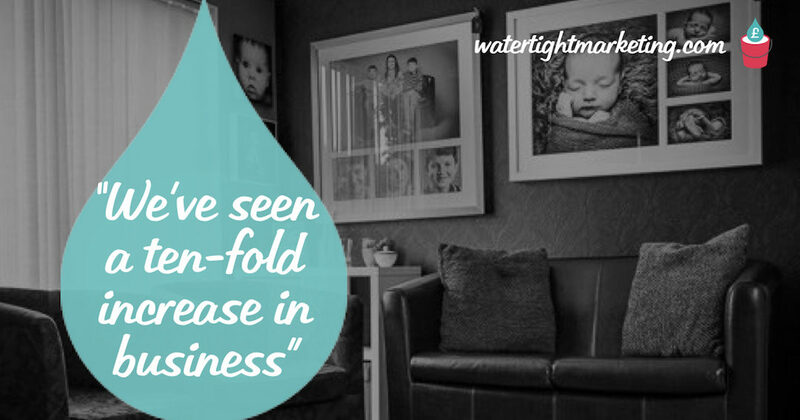 As part of the Companion Course for Chapter 2 from Watertight Marketing, Andy and Debbie reviewed their marketing against the Thirteen Touchpoint Leaks™. This is Watertight Marketing’s bottom-up analysis that identifies how businesses lose both customers and profit from their marketing activities — and creates a traffic light action plan of priorities, putting those that need immediate attention at the top of the list. So, what leaks jumped out, and what did they do as a result? Family photography lends itself to anniversaries and therefore repeat purchase — so it made particular sense to focus their attention on past clients that had already purchased. They identified a series of events that could be used to re-contact clients. The anniversary of a newborn shoot could be marked with a birthday card, Father’s Day created an opportunity for both a new shoot but also to purchase display artwork as a gift. They also support a charity where they’ve invited VIP clients to a exclusive mother and child photoshoot — and proceeds have gone to SANDS — the neonatal and and infant loss charity that’s so important to the families they meet. Andy and Debbie had long struggled with how to trial their services. After all, how do you trial a photographer without actually taking photos? They were brave enough to create a no obligation trial (where all the risk was with them), and the result has been a turning point for the business. Related content: How to incorporate a gateway product to win more business. Their third priority marketing leak was ‘No critical approval’ — or, the dreaded ‘power of veto’. Before spending a lot of money a buyer will often consult a third party. If that person says no to the purchase it will rarely proceed. 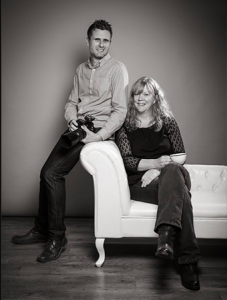 There are many decision makers when choosing a particular photographer. It’s not just the parents, grandparents have their say too — and, with an increasing incidence of pre-birth pregnancy shots — parents want to see examples of work. All of which demands evidence — and customer reviews. As Andy and Debbie wanted to showcase their work in-situ in clients homes (an important differentiator for them), they spent a lot of time getting in touch with past clients to create powerful examples for their website. They’ve also been much more proactive in asking for reviews at the end of each assignment. They now incorporate this into a thank you card. And, while they’ve been big fans of Facebook, they now use Instagram too as that’s where they feel their next generation of customer will be looking for evidence. 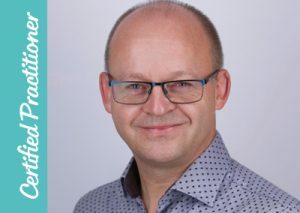 Of all the leaks they’ve addressed via the Watertight Webschool courses, Andy feels that having the courage to create an attractive trial offer for clients has seen the biggest transformation in the business.